Tiffany Yachts builds a truly rugged and first class vessel! She is overbuilt. "Extravaganza" was the 2nd Tiffany Yacht built by the owner, because he was so impressed with the overall quality. You will notice exceptional wood craftsmanship throughout, cherry and maple. Athortship master stateroom with his and her head. The Tiffany 68, completed in 2004, is an enclosed bridge yacht fisherman. The 68 was designed to offer luxurious comfort, a smooth ride, and ease of maintenance. Randy Cockrell of Tiffany Yachts designed the 68 using CAD and the company’s 5-axis CNC router. The CNC router allowed for a precise one-off mold. The hull was laid up with solid FRP bottom and foam cored sides. It has an extensive stringer system for structural integrity. Superstructure is molded of foam-cored fiberglass. 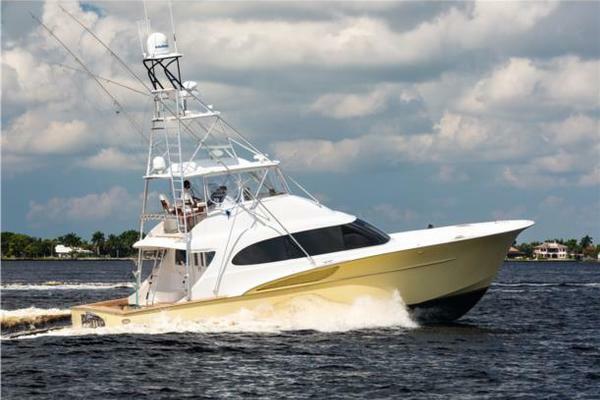 Finding a suitable blend between a comfortable yacht and fishing capabilities is a challenge. EXTRAVAGANZA nails it!! 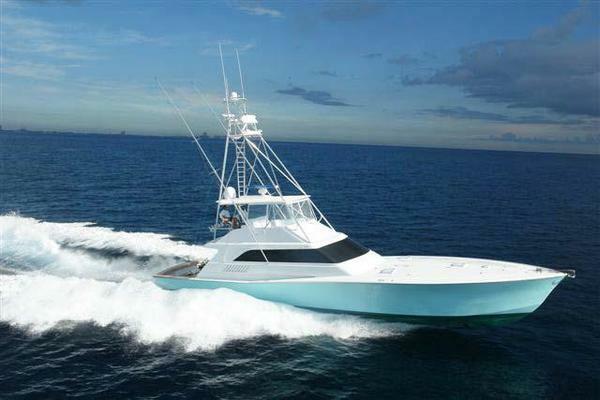 Custom designed and built by the renowned Tiffany Yachts in Burgess Virginia, she is the ultimate Enclosed bridge Yacht fisherman. Perhaps the greatest feature is the sea keeping qualities -- smooth – safe & efficient in most any sea condition. Entering through the mezzanine deck varnished, teak door, you will first notice the spacious salon and galley, accented by satin finished cherry wood throughout. A custom L-shaped leather sofa is on the port side. Underwater coral reef carpeting and granite bar with 3 green swivel bar chairs. The cabinet features a 50” Pioneer Plasma Screen Monitor that rises up by remote control. The U-shaped galley has diamond inlays of quarter sawn cherry. The counter tops are of Black Galaxy Granite. The sole is of traditional teak with black seams. Adjacent to the galley is a dining area. An upholstered L-shaped settee with seating for 4 has a cherry table with the profile of the Tiffany 68 inlaid of maple, walnut, and teak. Aft of the settee is a curved cabinet with integral grab rail and floating steps to the bridge. The breakfast bar has seating for three. The master stateroom is of cherry with quilted maple inserts. The queen berth has a Tempur-pedic mattress. A mirrored vanity is adjacent to the louvered hanging locker. The vanity has storage under and a laundry hamper with lid. There is an upholstered seat for lounging. A recessed locker has drawer and shelf storage. The master has his and her heads with a shower between. The mirrored vanities have Blue Pearl Granite tops and storage under. The forward stateroom is of flat cut and quarter sawn maple with cherry accents. The queen berth has a Tempur-pedic mattress and storage under. An upholstered seat is perfect for curling up with a good book. The double lockers have hanging storage, shelves and a drawer unit. The private head has a spacious shower with glass door, a mirrored vanity with Madura Gold Granite counter top and storage under. The bunk room is of maple with cherry accents and features a fun sea life print on the bedding. It has a double berth on the bottom with a twin above. The hanging locker also has shelf storage. The private head has a shower with glass door and mirrored vanity with a bright yellow Corian counter top. Extravaganza is powered by twin Detriot/MTU 16V2000, 1800HP diesels with ZF 2555 V-drives. She has a cruising speed of 32 knots and a top speed of 35 knots. She carries 2200 gallons of fuel and has cruising range of 425 miles. Two Onan 27.5 kw generators provide auxiliary power. Climate is controlled by Cruise Air tempered water system. She has a Sea Recovery water maker, Westmar 25 hp variable speed bow thruster, Pipewelders hydraulic outrigger holders and hydraulic antenna lay-downs. The electronics include a NavNet 10.4″ color radar, Northstar 952xw GPS with differential, Northstar 962XD chart plotter with color depth, Robertston digital depth and digital water temperature, Icom SSB and M125 VHF radios, and a display for the 4 security cameras. The cockpit has a mezzanine level with molded seat and storage. The cockpit also features a transom fish box plumbed to the Eskimo Ice Machine, and a large engine room access door. The spacious engine room is designed for easy access to all equipment. A work bench has storage for tools and bench top vise. There is ample room outboard of the engines. The forward deck has a curved sun bathing platform with storage under. The storage accommodates lines, scrub brushes, fenders, a hose reel, and shore power cable. The walk arounds are wide and have grab rails conveniently located. 3 steps from the cockpit up is the mezzanine seating with large bench seat, varnished storage drawers, aft camera, varnished teak bulkhead and door, overhead lighting and spreader lights, and covered seating. If your priorities are in order – a ruggedly handsome, quality built vessel with impressive offshore riding characteristics -- EXTRAVAGANZA is a must see. Best described as ROBUST, she is well appointed and equipped for extensive cruising and fishing. Truly one of a kind, EXTRAVAGANZA , true to her name, will not disappoint.